I typically begin my Personal Worship Times with God by lighting a candle. It’s not for ambience (although it is pretty cool), but as a reminder of God’s presence with me through the Holy Spirit. This morning as I started to light my candle, I noticed something: the wick was bent over and caked with wax. As well, the candle container was damaged. Now, the candles I use are those cheap, starter candles called “tea lights.” I think I paid $2 for 400 candles (shows how cheap I am). Anyway, my first inclination was to throw away that candle and get a new, fresh candle with a nice straight wick (they are a lot easier to light). In this passage, Isaiah is giving a character description of the Servant of Yahweh, the Messiah. As Christ-followers, we understand this to be a “snapshot” of our Lord Jesus. Here, Isaiah uses a beautiful, poetic metaphor to describe this Mighty Reedemer-King as One who is so attentive and caring that he will not break a reed that is already on the verge of being useless. Nor will he put out a candle wick that struggles to keep the flame going. Rather, he will minister justice and compassion on these fragile vessels until they are nursed back to strength. The first thing I had to do was to un-bend the wick so that it would not break. That took extreme care. 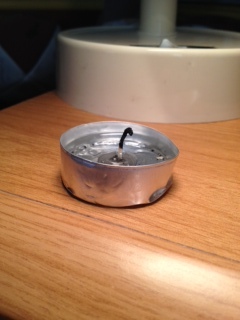 Then it took several attempts to light the wick. I noticed that the wick struggled to keep the light because it was “drowning” in a pool melted wax. The damage on the container caused the candle to be lopsided, which led to this accumulation of melted wax around the wick. This was getting frustrating! But then the idea of draining some of the wax came to mind (I wonder where that came from? Smile.) So I carefully tipped it over and drained the excess wax out of the candle. 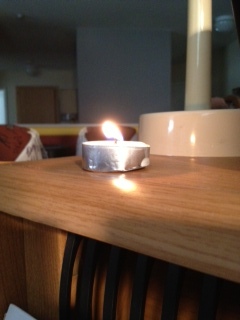 Immediately, the wick was free to “shine the light.” In fact, it blazed! And then I wept. God was teaching me something very profound through this. First, He was giving me a first-person experience of why He is so tender. The more I worked on that candle, the more valuable it became to me. What I first thought was a cheap, candle worth half a penny, became a noble vessel of light. The King sees the true value of people; not the “market value.” That is why He is so tender and care-full in how He treats even that which seems to be the least. Second, I was reminded of how gently the Lord treats me when I am bruised or damaged. He is so thorough in granting me the grace, truth, encouragement, and support I need when I am down and out. Some of you reading this today are at that place of being bruised or damaged and feeling worthless. The Master does not see you that way and He cares for you, deeply. Open your heart to Him, this moment, and let His tenderness in. And keep your eyes open, for it will come in ways you might not expect – and you may miss it. Finally, as a “wick” that was not snuffed out, but restored (like my little candle), I am in a position to minister to others in the same way Christ has treated me. As the Master has been compassionate on and tender toward me, so I follow in His steps and in His name in my treatment toward others – either the ones He brings my way or the ones He sends me to serve. I find it incredibly awesome and humbling that we serve a Lord who does not “lord it over” us – though He justifiably could. Rather, He knows we are bruised reeds and smoldering wicks in need of justice and compassion. He uses His power – not to coerce or judge or discard – but to free, to restore, to renew, and to transform. That is why I am a Whole Life Worshiper of my noble, kind King. I hope that is one reason why you worship Him with your whole life. So, fellow “Tea Lights,” let us blaze for Him as we serve others in the same way He served us. Doug, you are definitely hearing from the Holy Spirit and this is an amazing example as each of us are like that wick at times. Thanks for sharing. I am sending it to my brothers and sisters in Kenya. From one who is bruised and broken… I’m gonna let it shine! Thanks for the encouragement from the Holy Spirit of God!! on September 4, 2013 at 4:32 pm | Reply Les Ferguson, Jr. I can never thank you enough for what you do. I had an amazing nudge from the Holy Spirit, for a dear brother after reading this blog and studying the scripture in Isa 42:3. I appreciate this work/gift that you do so very much! Janice, it seems that the Holy Spirit has been busy nudging people this week. Thanks for responding to His nudging! A new friendship was made and some great encouragement was exchanged. Our tender Lord is so good!